By now I’m completely hooked!!!! But how can I get invited to the race? In 1990, again I read about these “nutters.” This time seven had completed the Badwater race, I bombarded the race organisers at Hi Tec with faxes and telephone calls and finally got accepted to compete in the 1991 Hi Tec Badwater. The Badwater race, from a quiet start, has increased interest from the first few years until Chris Kostman’s AdventureCORPS took over the running from 2000. Now it boast full fields of nearly 90 runners spread over three start times with strict qualifying standards. To be in the Badwater “family” is a hard won privilege!! 1991: Hi Tec Race Director David Pompel. Start 600pm. 14 start; 14 finish. 1992: Hi Tec Race Director Chris Stai. Start 600pm. 16 start; 13 finish. I decided to do Badwater one more time! That’s all: one more!!!!! 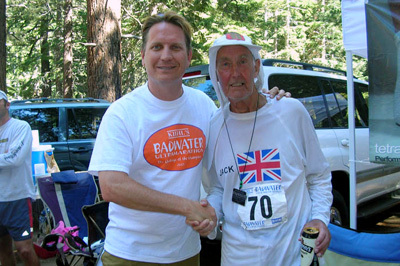 During this race I met Richard Benyo at mile 111 (1st runner to do the Death Valley 300 with Tom Crawford) who was on his way back to Badwater on a repeat 300. Mags, my wife, had purchased his book about the Death Valley 300 at Furnace Creek, so she got him to sign it. I said to him that I was interested to emulate his achievement and he replied “If anybody can do it, it will be you!” I raised £3,600 for the Scanner Appeal that year. 1993: Hi-Tec Race Director Chris Stai. Start 600pm. 12 start, 10 finish. 1994: Hi-Tec Race Directors Karen Raby and Pam Riggs. Start 600pm. 23 start; 16 finish. Remembering Richard Benyo’s remark that I could do the Death Valley 300, I thought “So why not! I will do the 300 with my mate Steve Kerr, then retire, that’s final! !” After completing the Badwater race and hiking to the summit of Mt Whitney (150 miles) our support van broke down on the return leg at Panamint Springs, Now in those days there were no telephones at Panamint—only a radio link to Lone Pine—so after a long hectic time on the two way radio, a replacement van from Las Vegas was arranged via Lone Pine. Not wanting to waste time, we carried on with a car as support until the replacement van caught us. Steve and I completed the out and back and became the joint 5th ever to achieve this challenge. I raised £5,624 for our Air Ambulance. 1996: Hi-Tec Race Directors Matt Frederick/Diane Kurity. Start 600am. 26 start, 14 finish. It is now a 600am start time because it appears it’s too easy with a 600pm start. Hang on! There is a walk section this year, I’ve never done a walk race, I have to try this, then retire! I really enjoyed this race and finished quite comfortable with hardly any pressure. I raised a lot of funds for Disabled Childrens Stepping Stones and Simon Paul foundation. 1997: Hi-Tec Race Director Matt Frederick. Start 600am. 27 start, 20 finish. Disaster!!!! My only DNF.—had to drop at Stovepipe Wells because of dehydration, etc. Will have to come back again and put this right. Anyway, still raised £3,500 for Hospital Hydrotherapy Pool. 1998: Hi-Tec Race Director Matt Frederick. Start 600am. 29 start, 20 finish. First I have to put last years DNF to rest, the second reason to do the race is that “Real TV Productions” are making a documentary with Marshal Ulrich, Lisa Smith, Scott Weber and myself and to show it on TV over a five day period. I raised £2.600 for Marie Curie Appeal. Retire? Not yet, beginning to get a feeling I could get to ten finishes, then retire!! 1999: Hi-Tec Race Director Matt Frederick. Start 1000am. 42 start, 33 finish. Mel Stuart Film Productions made a 1hour, 40 mins film of the race featuring fourteen competitors of which I was one of the lucky runners to be selected, The film is “Running on the Sun.” Much to the joy of Mel Stuart, the race had a lot of things which don’t normally happen in Death Valley: the night before there was a freak storm and heavy rain with streaks of lightning, Furnace Creek awash with flowing water, the road to Badwater was blocked so instead of a 600am start we had to wait until the road was cleared by the park staff for a 1000am start. With the sun now out, it was perfect conditions for filming, as the storm was still around during the race with the wind and dust. I raised £6.000 for Crohns Research Charity. 2000: AdventureCORPS Race Director Chris Kostman. Start 800am. 69 start, 49 finish. This race was the beginning of AdventureCORPS’ involvement in promoting the Badwater Ultramarathon and it brought sanity to the entry system and, most important, to the start procedure, as now there was a three wave start which cut out crowding for runners and crew. I had the usual problems in race, i.e. heat exhaustion, too hot, not drinking enough, not eating, but I “enjoyed” it as I’m a bit mad!!! After the finish, we were having a well earned meal in PJs when we were asked if there were any volunteers to help crew my UK friend Chris Moon on the way back to Badwater on his Death Valley 300. Mags said later “I saw Jack look across at Frank McDonagh (crew member) who winked back. They were out the door in a flash. So much for our rest!!! !” I raised funds for a Rotary Handicamp for disabled childrens holiday and for Alzheimer Society. 2001: AdventureCORPS Race Director Chris Kostman. Start 600am. 71 start, 55 finish. I thought to myself, if I can finish, it will make nine completions, which will put ten finishes one step away. I don’t take any chances and get to the end OK. I raised £1,550 for Crohns Research, more cash for Rotary Handicamp for disabled childrens holiday, and cash for the school where I’m caretaker for playground equipment. 2002: AdventureCORPS Race Director Chris Kostman. Start 600am. 78 start, 59 finish. It’s the 25th Anniversary of the first Death Valley crossing by my mentor and dear friend Al Arnold who was the guest of honour for the race. He asked me to join him on stage where I gave him a personal souvenir to mark his achievement. A few years earlier I had sent him a letter telling him jokingly that “When we meet in the future I don’t know what to do to you for starting this Death Valley madness: either I will shake your hand or wring your neck.” On stage he turned to the audience and said “Well!, what are you going to do, Jack?” I shook his hand!!!! BUT, this was to be my 10th and final race, what a combination this was to be: The 25th Anniversary and my 10th, with Al Arnold greeting finishers; no way was I going to fail! Yes, I finished the race, and there was Al Arnold at the finish. I was very happy receiving my finisher’s medal, now for a celebration for my retirement. I raised a lot of funds for Cerebral Palsy. Jack and crew eager for his “final finish” in 2005. With race director Chris Kostman at the finish. And, keeping with tradition, enjoying a can of Murphy’s. 2003: AdventureCORPS Race Director Chris Kostman. Start 600am. 73 start, 46 finish. 2004: AdventureCORPS Race Director Chris Kostman. Start 600am. 72 start, 57 finish. I came out of retirement for this race: I just can’t say no!!! Chris Kostman called Marshall Ulrich and myself on stage at the pre-race meeting and presented the both of us with wooden plaques to mark our ten finishes in the Badwater Ultramarathon. I felt very proud. As for the race, I hadn’t trained much, because having done it so many times I got a bit casual—big mistake! I paid dearly for this lapse, proving that you must always take the race serious. I missed cut-off, but was allowed to be a “Honourable Mention Finisher.” There was a 2nd attempt for a runner to claim the title “first 70 year old to finish Badwater,” but he dropped near Lone Pine, so now I had to come back to get that record in the 2005 race. 2005: AdventureCORPS Race Director Chris Kostman. Start 600am. 81 start, 67 finish. This is what I’ve been training for! To finally go for the record as the “first 70-year-old to complete the Badwater Ultramarathon.” On every part of course I was encouraged and urged on. It was a fantastic feeling to be known by so many. Wearing the 70 number, with my support crew, the finishing tape coming into view, words can’t describe my gratitude to my team in getting me to my dream. Now I will retire, or maybe?… I raised funds by sponsorship for Cerebral Palsy Care, MS Society, and Stepping Stones Children’s Charity. This year, 2006, will see me together with Mags back in Death Valley, putting something back in the race by joining Chris Kostman’s team as volunteers. Over the years I have given respect to all other competitors and the helpers, and have had total respect in return. I’ve had American friends together with my UK friends as support crew, it seemed to work well (bar the language and humour difference, only joking!!) On a serious note I believe the mental strength involved in finishing the Badwater race is in all people—it just takes the right motivation to allow it to surface. In my case, the motivation was seeing the positive reaction of people prepared to sponsor me in the Badwater race in my quest to fundraise for worthy charities. 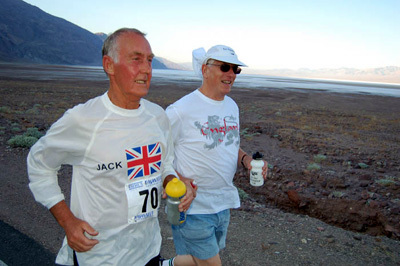 Jack was inducted into the Badwater Hall of Fame in 2006 (click here to see all inductees).